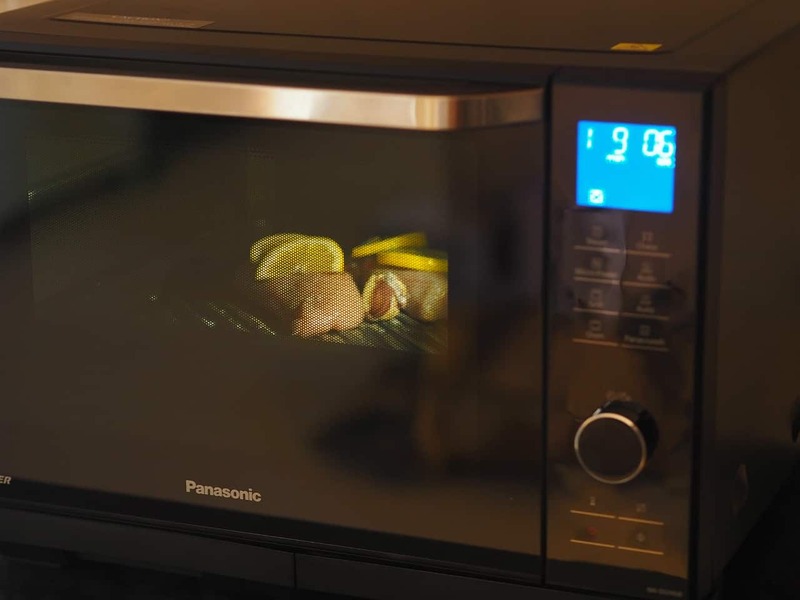 You may remember from my previous post that I’m in the process of reviewing a whole host of kitchen goodies by Panasonic. I can’t lie I’m enjoying this collaboration so much: every couple of months something exciting turns up at my door and I try to make it look at home in my kitchen. 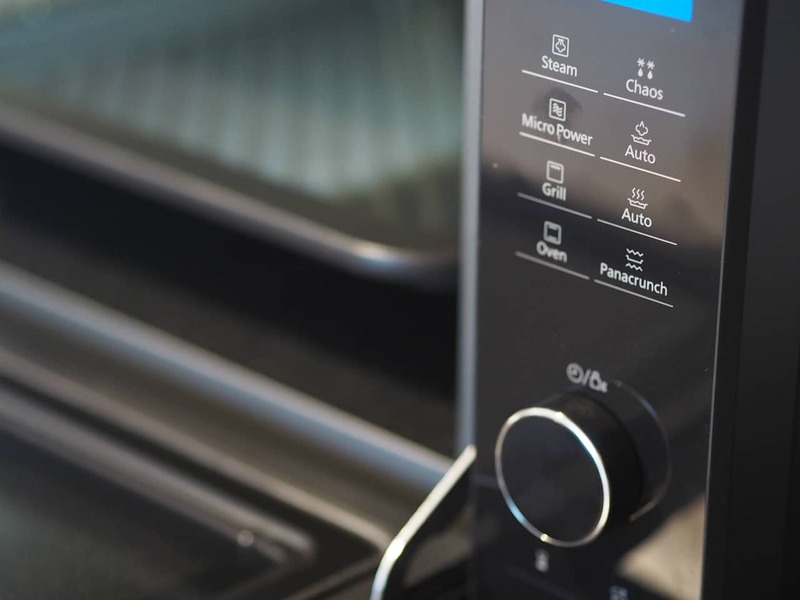 I say that, because the Panasonic range is seriously shiny and the appliances look ever so slightly out of place in my not-as-shiny kitchen… they look as though they were made to stand upon sparkling marble work tops! 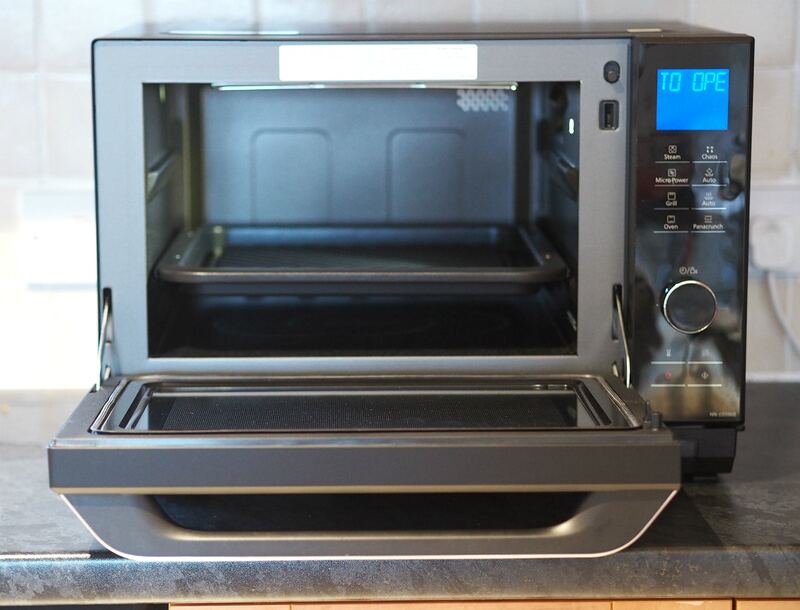 This time I got the heads up that I was receiving a ‘microwave’ and admittedly my first reaction was, “Oh.” I mean, how exciting could a microwave be? What could I possibly share about it with you guys? Well, turns out it is a microwave. But it’s also an oven… and a grill… and a steamer. It’s everything you guys. It’s everything, wrapped up in one shiny, beautiful package! Oooh it’s so slick, with so many possibilities. A cook’s heaven! There’s even some crazy modes like ‘Panacrunch’, which ensures that cooking things like pizza and pastries which are meant to have a crunch… well, that they have that crunch! No soggy bottoms apparently; I’ll have to try that one and report back, but for now I was set on steam mode. Steam is surprisingly speedy when it comes to cooking, and the moisture is retains in your food is unreal. I don’t steam nearly as much as I’d like to. I was suddenly feeling inspired to make use of some fantastic Italian taglioline I’ve been saving for the right occasion. I also wanted to challenge the steam move by cooking the blandest of meats: the chicken breast. If this oven could make this tasty I was sold. But first, let me talk about the the pasta. 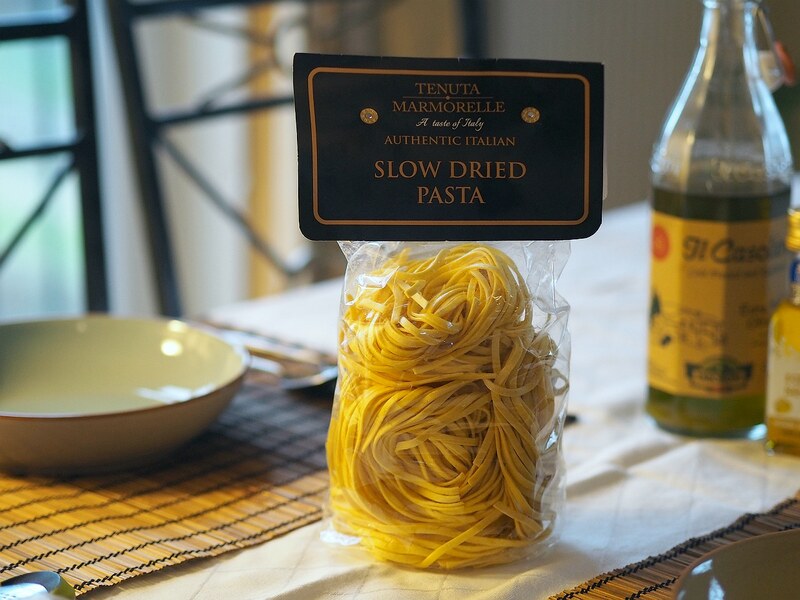 Tenuta Marmorelle have the most incredible quality pasta. This Taglioline is rich and chewy and infused with lemon. Carb enthusiasts will absolutely want to get acquainted with this. 1 lemon, halved and zested. For this recipe I will be steaming my chicken. 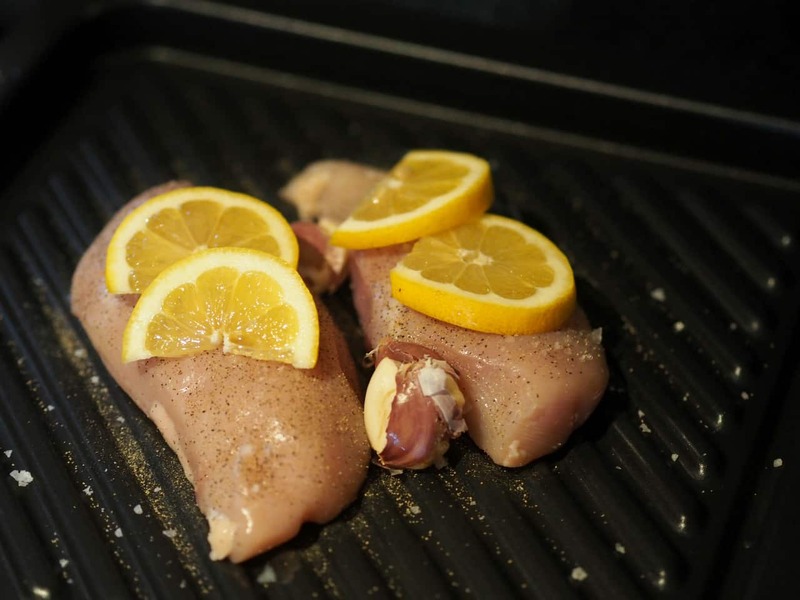 I start by placing the breasts on a tray with a few lemon slices, 2 crushed garlic cloves and cracked black pepper. That’s it – no oil required with steam. It then goes into the steam oven on medium for 12 minutes. While that’s cooking, the taglioline needs to go into a pot of well salted boiling water. I find that this pasta takes a little longer to cook than usual, so I get it on early. In a pan, on a medium-low heat add some olive oil, seasoning, a minced garlic clove and a white onion. As it browns, add the oregano and stock cube and add in the white wine finally add the cherry tomatoes and turn down to a low heat. When the chicken is done steaming, add it to a griddle pan on medium heat with the lemon and garlic it steamed with (add fresh if you cooked your chicken in another way) and drizzle with the honey. Cook until browned and remove to rest. Drain the taglioline and add it to the sauce. Squeeze in half a lemon and the zest and stir in the creme fraiche. 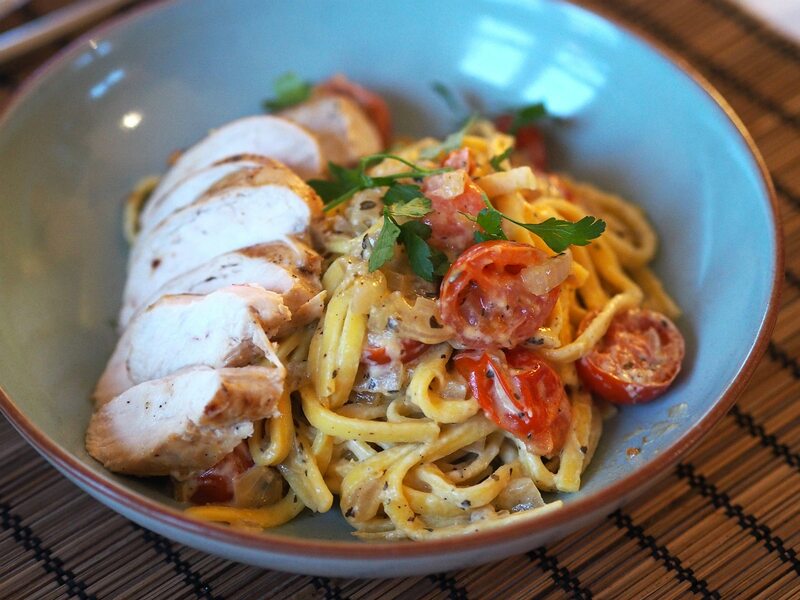 Serve in a pasta bowl with the chicken sliced. Behold! I cannot tell you how much I enjoyed this dish. As an optional garnish I finished mine off with a sprinkling of fresh parsley and a tiny dash of white truffle oil. 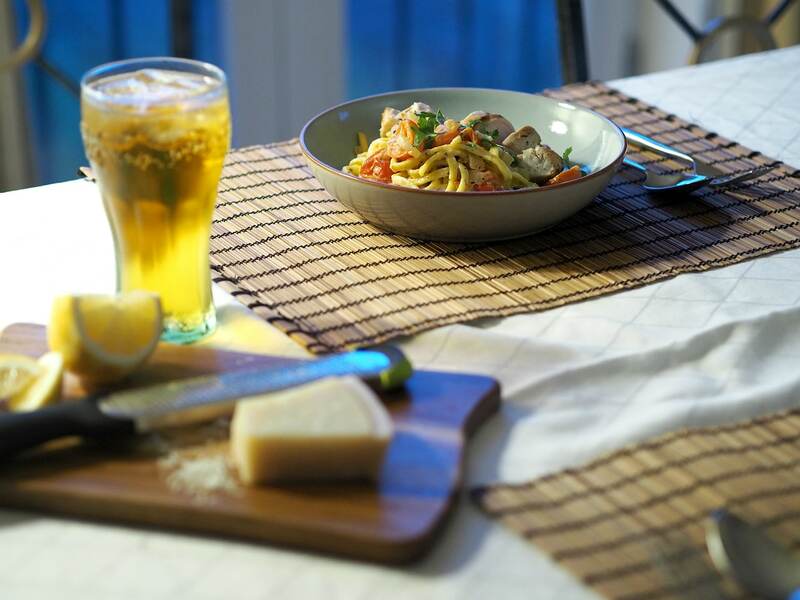 This meal is very simple, it relies on fantastic ingredients and the quality of the taglioline along with that *perfectly* cooked, ultra juicy chicken makes this unbelievably delicious. Not bad for 20 minutes work huh? Yep. I’m steaming everything from now.